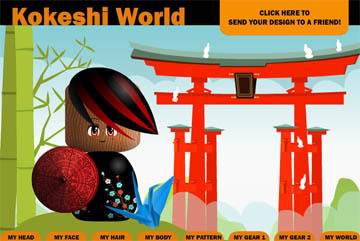 Create your own custom kokeshi and then send it to friends! Our game on janmKIDS lets you play while learning some fun cultural facts. Take a fresh look at the traditional and iconic Japanese kokeshi folk toy by exploring its origins and history, as well as what contemporary artists are producing in homage to this humble object. A special display of custom painted kokeshi is also featured—and available for sale at the Museum Store—by over 100 well-known international contemporary artists. This exhibition is sponsored in part by Daruma Asset Management, UCLA Paul I. & Hisako Terasaki Center for Japanese Studies, and Aratani Foundation.